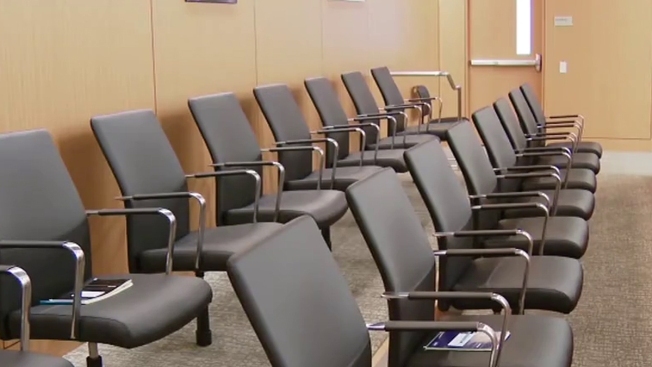 File image of empty jury chairs in a San Diego courtroom. A man called for jury duty in Hawaii shouted "he is guilty, he is guilty" outside a courtroom and ended up spending a night in jail. That's according to a lawyer representing Jacob Maldonado. The attorney says Maldonado was having a bad day during Tuesday's outburst and wanted to get out of being on a jury on an assault case. The judge wasn't amused and ordered Maldonado's arrest on a contempt charge and set a $10,000 cash bail. Maldonado spent the night in jail. He was released without being charged or fined.